My gold and silver leaf blanks sold very well. I was shocked. So I was getting ready to make some more, but the temps have been VERY cold here. Keeping the resin warm during the mixing and pouring was a challenge. That means the possibility of air getting trapped and not able to escape the resin, resulting in bubbles in the casting. I'm not excited about having bubbles in my casting, but I'm not about to cast polyester resin in my house either. That's when I decided it was time to work with pressure casting. 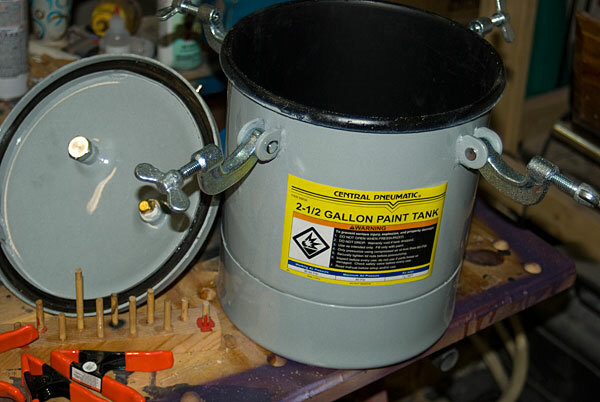 Lots of folks have written about how they used a Harbor Freight paint pot (item 66839) for their pressure casting, so I figured I'd give one a try. I had an ad from HF with 20% off any one item, plus what appeared to be a decent air compressor at $99. It was the 2HP 8Gal horizontal compressor (item 67501). Checking it out in the store, I was happy with it for the price. 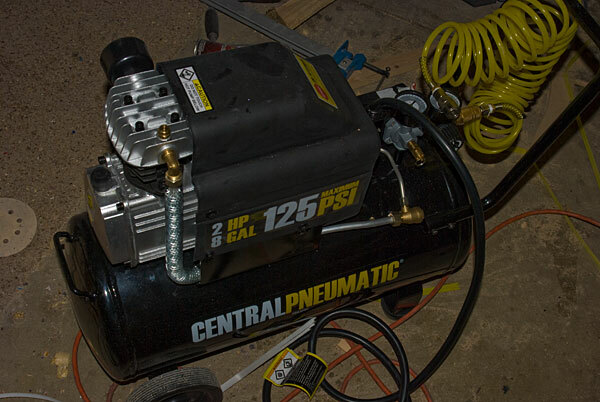 So, for well under $200, I came out with a compressor, a paint pot, and an accessory kit (hose, fittings, etc). I got it home and started with the compressor. Super easy to assemble. Filled it up with 30w compressor oil and did a 1 hour break-in. A little bit of sparkly stuff came out with the break-in oil, but not much. I'll change it again in a little while. It had no problem getting up to 100psi and held it overnight. Nice! I then tackled the tank. There is a single mod that *has* to be done, and some testing as well. The pickup tube inside the lid needs to come out. Otherwise it would be in the way of anything I placed inside. The write-ups I've read said they had a lot of difficulty removing the tube, and ended up just cutting it off. I twisted it by hand and the thick wall aluminum tube came right out. It was 3/8" NPT threaded. I headed to Lowes and for $2 bought a brass plug with the same thread. Taped it up and put it in from the inside. The outside shows an open fitting, but it's sealed from the inside. A mod that's been suggested is to add a brass elbow to the air entry point. But my model came with a deflector that keeps from shooting the air right into the resin inside the tank. So that mod wasn't needed. I lubed the lid seal to let it wiggle and settle into place. Lubing also prevents it from gluing itself to the lid or the pot. I connected everything yesterday and ran up the pressures. First to 20psi. 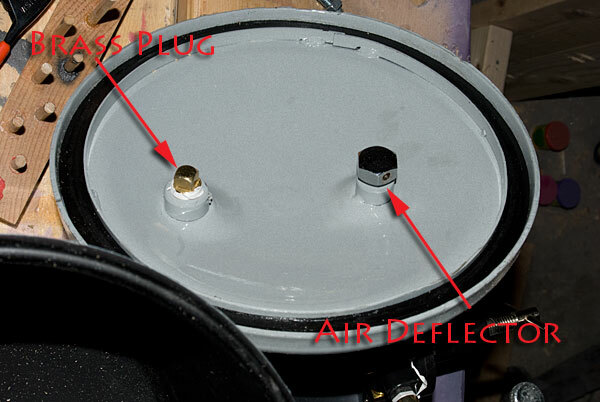 The gauge on the pot and the gauge on the compressor matched within a pound. Nice! I did that a couple of times, releasing the air and then refilling. Once I was happy with that, I ran it up to 40psi. The seal popped out at 40psi, I think I didn't clamp the lid down evenly. I reseated the seal, clamped the heck out of the lid, and did it again. Much better! I left it overnight, and when I went into the garage this morning it was still holding just a whisper less than 40psi. Sweet! 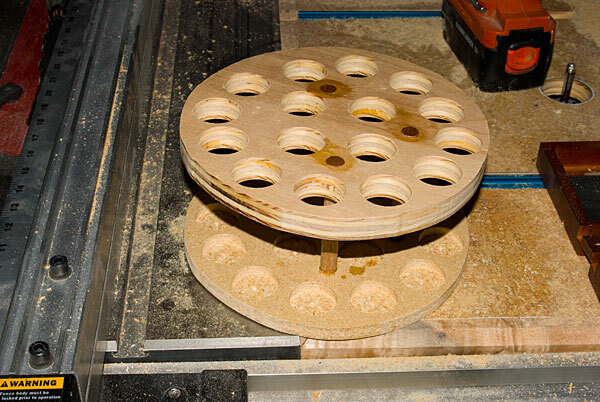 The insert fits nicely into the pot and holds my pipe molds upright. Tonight I'll do my first cast! Interesting and a bit curious of the stuff.Hope you dont mind.